A vivid and revelatory novel based on actual events of the 1847 Oregon migration, A Sudden Country follows two characters of remarkable complexity and strength in a journey of survival and redemption. James MacLaren, once a resourceful and ambitious Hudson's Bay Company trader, has renounced his aspirations for a quiet family life in the Bitterroot wilderness. Yet his life is overturned in the winter of 1846, when his Nez Perce wife deserts him and his children die of smallpox. In the grip of a profound sorrow, MacLaren, whose home once spanned a continent, sets out to find his wife. But an act of secret vengeance changes his course, introducing him to a different wife and mother: Lucy Mitchell, journeying westward with her family. Lucy, a remarried widow, careful mother, and reluctant emigrant, is drawn at once to the self-possessed MacLaren. Convinced that he is the key to her family's safe passage, she persuades her husband to employ him. As their hidden stories and obsessions unfold, and pasts and cultures collide, both Lucy and MacLaren must confront the people they have truly been, are, and may become. Alive with incident and insight, presenting with rare scope and intimacy the complex relations among nineteenth-century traders, immigrants, and Native Americans, A Sudden Country is, above all, a heroic and unforgettable story of love and loss, sacrifice and understanding. 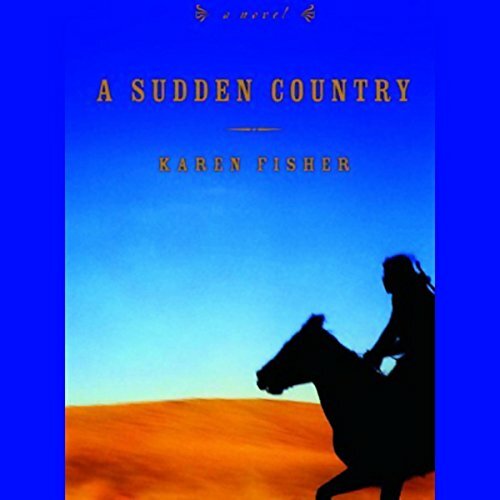 ©2005 Karen Fisher (P)2005 Books on Tape, Inc. I loved listening to this book. The story is gripping, with two flawed and complex protagonists whose lives intersect and then diverge again. The prose is simple, yet somehow reveals emotional depth and conveys both the joys and the horrors of life along the Oregon Trail. The narrator's understated performance matches the writing perfectly. The reader is in need of lessons. After two hours of the book I realized I knew nothing of what the book was about. If the reader could changer her voice for the different characters it would help. This book was a book club selection and, because of the lukewarm reviews here about the narrator, I was hesitant to order it. I was wonderfully surprised to find it a very compelling read and well narrated. I did not find the reader flat at all but measured which fit the words. It's a wonderful story and beautifully developed and written. This is such a good example of why you ought to listen to a book because the language is so lyrical and descriptive that it lends itself to being heard rather than read to oneself. It was one of those books where I could barely stand to put it away - and found my life interrupting my reading! The story itself isn't bad, but this is unlistenable. The narrator just kills it. So sad. Dull story and duller narration. This book probably would be enjoyed more in print than audio. Story is confusing and difficult to follow. I was lost from the beginning and never really enjoyed the story. You may enjoy this book if you like complex story lines and long character development. The story jumps back and forth between times and scenes. The author seems to abruptly change scenes in mid sentence. The narrator spoke in monotone. The sentences and paragraphs seemed to run together. There was no emotion shown as the story developed. Always the same narration style regardless of the story moment. I have difficulty listening to female narrators on certain subjects. Stories of the old west seem to be told best by male narrators. This is a personal perspective only. I bought this book as it sounded so interesting but it was so slow ( I had to speed up the recording) The narration was especially poor. It might have been better if the narrator had had some emotion in her voice but it was flat flat flat!!!! I really tried to keep it going but in the end I had to give up, what a waste of money.